A large group of East Village, Noble Square and Eckhart Park residents converged on the Chicago Avenue office of Ald. Walter Burnett Jr. on the evening of Thursday, Feb. 19. Their appeal to the 27th Ward alderman, one that they have made several times previously, was simple: Request landmark designation for St. Boniface Church before it’s too late. Suprisingly, Ald. Burnett agreed to do so, and even signed the Commission on Chicago Landmarks’ Landmark Suggestion Form. But the fear is that it’s already too late. The 90-day demolition delay expires March 4, and Burnett’s request won’t be on the commission’s agenda until the April meeting. The archdiocese could legally demolish the vacant building at 921 N. Noble St. in the intervening time. It is difficult to know whether this is a cynical last-minute attempt by the alderman to sign on with preservationists to avoid blame if the church comes down, or whether word of a potential development deal has made landmarking a real possibility. Ald. Burnett disclosed that a developer is looking at the St. Boniface property as the potential location for a senior housing development that would include the restored church. The developer is seeking the generous tax benefits that come with restoring a landmarked property, but does not want to pay for the property. To work, such a deal would have to rely on a "property swap," whereby the archdiocese would transfer ownership of the church to the city in return for another property. The city would then transfer the St. Boniface to the developer. Apparently the archdiocese has been interested for years in Richard E. Byrd Community Academy, a public school in Cabrini-Green at 363 W. Hill St. Ald. Burnett has denied previous requests to give away the building, which the archdiocese would demolish to provide parking for St. Joseph school across the street. Now, the archdiocese’s interest in Byrd, the community’s desire to save St. Boniface and a private developer’s plan for restoring the church have created the unique potential for an eleventh hour solution. Although this is a positive turn of events, those attending the meeting left with many questions unanswered. 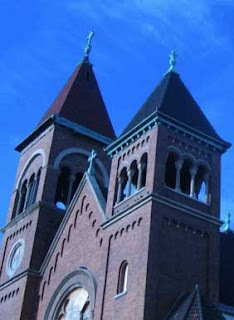 Will the archdiocese consent to extend the demolition delay another 90 days? Will the developer’s plans meet with community approval? Will the dismantled school facade be reconstructed? Will the three-way property transfer actually work? Perhaps one important fact that came out of the meeting can provide a clue: Mayor Daley wants St. Boniface saved.